SAMRO Foundation is calling for eligible keyboard players who consider themselves masters of the ivories to take on their peers and flex their fingers in the 2017 SAMRO Overseas Scholarships Competition for Keyboard Players. One of the highlights of the musical year, this year’s SAMRO Overseas Scholarships Competition is for Pianists, Organists, Harpsichordists and other keyboard players. 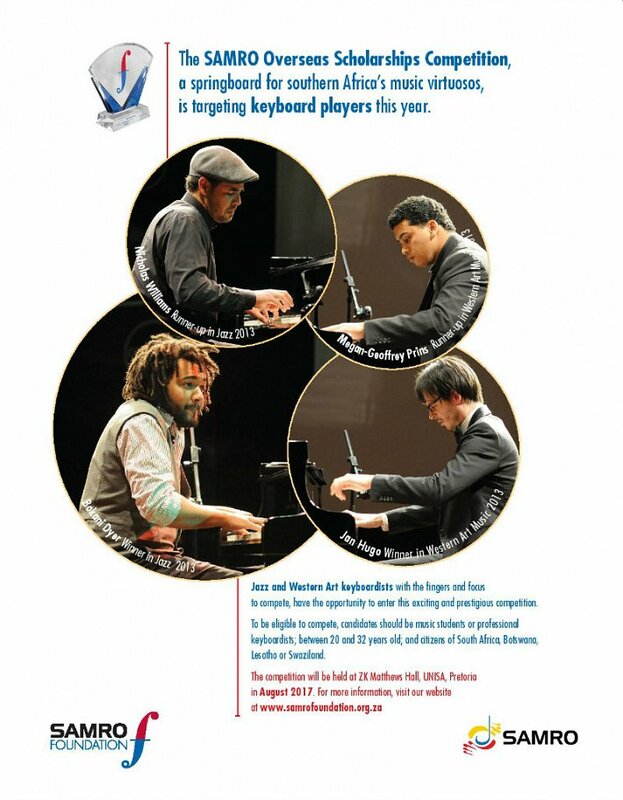 Four years ago pianists Bokani Dyer & Jan Hugo captured the spotlight and walked away with scholarships to help enhance their creative careers. They proved their technical expertise and their interpretive creativity amongst many peers from around the country. To be eligible to compete in the 2017 SAMRO Overseas Scholarships Competition, candidates must be a final year music student or professional keyboard players between the ages of 20 and 32, and a citizen of South Africa, Botswana, Lesotho or Swaziland. The competition takes place over three rounds: a preliminary round (in which a panel of adjudicators select the top candidates from the applications received), a semi-final round (in which the shortlisted Jazz and Western Art music candidates compete) and a final round, which will take the form of a public concert at UNISA’s ZK Matthew’s hall on 26 August 2017, featuring performances by the top two candidates in each category. To enter, aspiring candidates must download the regulations and the application forms from the SAMRO Foundation website (www.samrofoundation.org.za). For more information, contact samrofoundation@samro.org.za or 011 712 8417. Find the regulations for the 2017 SAMRO Overseas Scholarhips Competition for Keyboard Players here. To apply please download and fill in the three pages below. Pages 1 and 2 can be saved and emailed. Only page 3 will need to be printed, signed and scanned and emailed.